Attacks in Syria by the US-led coalition have killed more than 860 people, including at least 50 civilians. 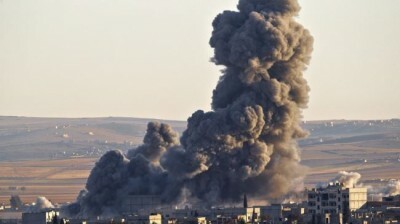 The so-called Syrian Observatory for Human Rights (SOHR) said on Wednesday that at least 50 civilians, including eight children and five women, were killed by US-led coalition airstrikes since mid-September. The UK-based group added that 746 ISIL militants and 68 al-Nusra Front terrorists had also been killed. This comes as the US-led coalition carried out three fresh airstrikes against ISIL positions near the Syrian city of Kobani on Tuesday, killing a number of militants. Meanwhile, top local officials in Syria said on the same day that Kurdish forces were advancing street by street in the southern areas of Kobani, which is close to the Syrian border with Turkey. They said the ISIL terrorists would soon be pushed out of Kobani. A recent report by the SOHR says more than 1,000 people have lost their lives since the ISIL militants entered the border city. The ISIL militants have committed terrible atrocities in Syria and Iraq, including mass executions and the beheading of local residents as well as foreign nationals. The US and its allies started their air campaign in Syria in September under pretext of targeting ISIL militants. However, they have also hit Syrian infrastructure including oil and gas facilities and attacked the provinces where ISIL militants are not active. The US and its allies have been staunch supporters of the al-Qaeda-linked militants fighting the Syrian government.